Mozart (Jazz Play-Along Volume 159). Composed by Wolfgang Amadeus Mozart (1756-1791). For EÂ§ Instruments, C Instruments, B-flat Instruments, Bass Clef Instruments. Jazz Play Along. Softcover with CD. 80 pages. Published by Hal Leonard (HL.843220).ISBN 1458403882. 9x12 inches.For use with all B-flat, E-flat, Bass Clef and C instruments, the Jazz Play-Along Series is the ultimate learning tool for all jazz musicians. With musician-friendly lead sheets, melody cues, and other split-track choices on the included CD, these first-of-a-kind packages help you master improvisation while playing some of the greatest tunes of all time. FOR STUDY, each tune includes a split track with: Melody cue with proper style and inflection • Professional rhythm tracks • Choruses for soloing • Removable bass part • Removable piano part. 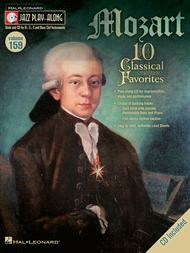 FOR PERFORMANCE, each tune also has: An additional full stereo accompaniment track (no melody) • Additional choruses for soloing.10 selections: Eine Kleine Nachtmusik (“Serenade”), First Movement Excerpt • Eine Kleine Nachtmusik (“Rondeau”), Fourth Movement • Laudate Dominum • Minuet in F Major, K. 2 • Minuet in G Major, K. 1 • Piano Concerto No. 20, Second Movement (“Romanza”) Excerpt • Piano Concerto No. 21 in C Major (“Elvira Madigan”), Second Movement Excerpt • Symphony No. 40 in G Minor, First Movement Excerpt • Symphony No. 40 in G Minor, Fourth Movement (“Allegro”) • Turkish Rondo.About Hal Leonard Jazz Play AlongFor use with all Bb, Eb, and C instruments, the JAZZ PLAY ALONG SERIES is the ultimate learning tool for all jazz musicians. With musician-friendly lead sheets, melody cues, and other split-track choices on the included CD, this first-of-its-kind package makes learning to play jazz easier than ever before. FOR STUDY, each tune includes a split track with: * Melody cue with proper style and inflection * Professional rhythm tracks * Choruses for soloing * Removable bass part * Removable piano part. FOR PERFORMANCE, each tune also has: * An additional full stereo accompaniment track (no melody) * Additional choruses for soloing.